With fall approaching quickly now is the perfect time to start decorating. 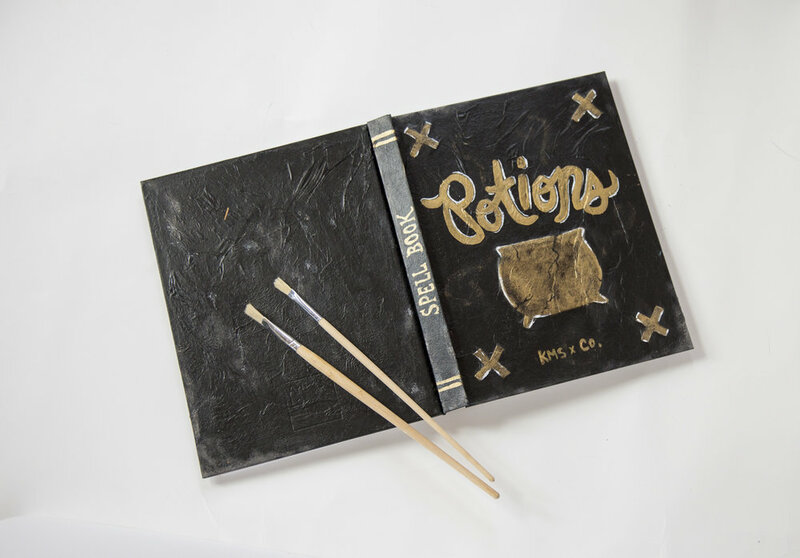 This DIY Spell Book tutorial originally created by my friend Savanna is easy, fun and you probably have most of the materials at home already. She suggested that I recreate this DIY for the blog so here it is! First step is to assemble your materials and decide on your designs. Once you have your idea in mind take your cardboard snack box and cut out any shapes that you would like to be raised on your book. This will add some subtle dimension to your final design. Place your shapes on the book and glue them down. Allow a few minutes for glue to dry before moving on to the next step. Once you have your shapes glued down the next step is to cover the entire front and back cover with a layer of tissue paper. I would suggest tearing all of the hard edges off of your tissue paper so that there are no harsh lines in your book cover. Lay your book open flat and paint on a thin later of Mod Podge. Arrange a collage of torn tissue paper over the book until it is covered. Paint another layer of Mod Podge. Continue until you have your desired coverage. My books only needed one layer of tissue paper but I was sure to make most of the pieces overlap, rip and crease to create texture and depth. Allow tissue paper layer to dry for about 20 to 30 min depending on how much Mod Podge you use. When it is dry it should be clear and you will know that it's time for the next step! The next and final step is to paint and decorate your book. This is actually the longest process depending on your design. I would recommend starting with a solid base coat of acrylic paint in your main color then using a contrasting color to add "dirt" and aging to your design. Make sure you allow your paint to dry before using a new color, that way your images and lettering will stand out rather than blending with the wet paint. Allow paint to fully dry and then you can display your new creation! Don't forget to paint the spine! Have you tried this DIY? Let me know what you think in the comments!